The Gold Star Mothers Distinguished Service (2nd Award) is presented to Mr. Eric Warden, President (on right) and Mr. John Fraser, Executive Vice President (on left) of ASM Research by Ward Nickisch (center), Co-Chairman of the Gold Star Mothers National Monument Foundation in appreciation for their continued outstanding support as Platinum Sponsor of the 3rd Annual Gold Star Mothers Family Monument Golf Tournament in September 2017. 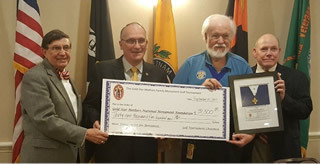 Mr. Eric Warden, President (on right) and Mr. John Fraser, Executive Vice President (on left) of ASM Research by Ward Nickisch (center), Co-Chairman of the Gold Star Mothers National Monument Foundation. 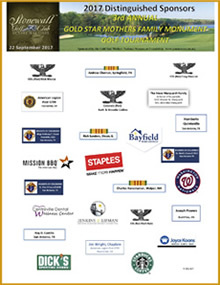 The check represents the proceeds from the 3rd Annual Gold Star Mothers Family Monument Golf Tournament in September 2017. 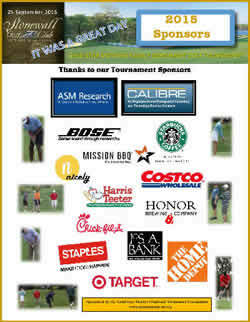 The Foundation is grateful for the outstanding support provided by ASM Research as one of the tournament's major sponsors since its inception. 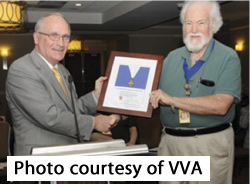 The Gold Star Mothers Distinguished Service Medal (2nd Award) is presented to Mr. John Rowan (second from right), President of the Vietnam Veterans of America, along with Mr. Rick Weidman (on right), Executive Director for Policy & Government Affairs, and Mr. Wayne Reynolds (on left), VVA Treasurer. At the same time a check is presented to Ward Nickisch (second from left), Co-Chairman of the Gold Star Mothers National Monument Foundation, representing the proceeds from the 3rd Annual Gold Star Mothers Family Monument Golf Tournament held in September 2017. 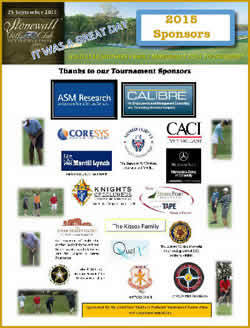 The Foundation is grateful for the outstanding support provided by the Vietnam Veterans of America (VVA) as one of the tournament's major sponsors for the second straight year. 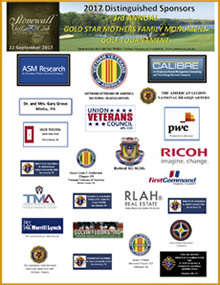 The Gold Star Mothers Distinguished Service Medal is presented to Mr. John Rowan, National President of Vietnam Veterans of America (right) by Ward Nickisch, Co-Chairman of the Gold Star Mothers National Monument Foundation (left) in appreciation for their Gold Sponsorship of the 2nd Annual Gold Star Mothers Family Monument Golf Tournament in September 2016. 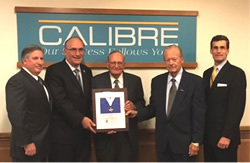 The Gold Star Mothers Distinguished Service Medal is presented to LTG (Ret) Terry Scott (center), Chairman of the Board, and to LTG (Ret) Thomas Carney (second from right), Member of the Board, of CALIBRE Systems. 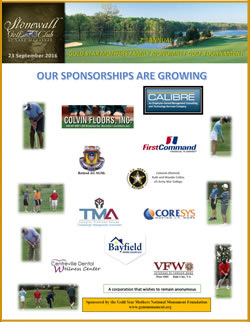 The presentation was made by Ward Nickisch (second from left), Co-Chairman of the Gold Star Mothers National Monument Foundation in appreciation for CALIBRE's Sponsorships of the Annual Gold Star Mothers Family Monument Golf Tournaments in 2015 and 2016. 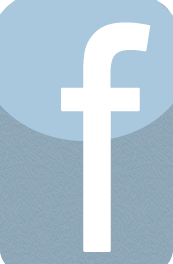 Mr. Ed Mason (left) and Mr. Philip Rizzi (right) of CALIBRE shared in the honor. 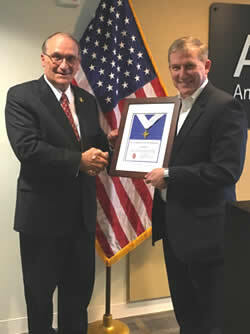 The Gold Star Mothers Distinguished Service Medal is presented to Mr. John Fraser, Executive Vice President of ASM Research (on right) by Ward Nickisch, Co-Chairman of the Gold Star Mothers National Monument Foundation (on left) in appreciation for their Platinum Sponsorship of the Inaugural Gold Star Mothers Family Monument Golf Tournament in September 2015.